[Place of publication not identified] : St Martins Pr, 2014., Emmaus, Pennsylvania : Rodale Books, 2014. Since when did every cookie on the plate have to be just like the next? Or each layer of cake exactly the same height? Each piecrust an impeccable work of art and encircled by stunningly perfect pastry leaves? To the uninitiated, all that fastidious, spotless baking is intimidating, not to mention exhausting. The Messy Baker celebrates baking as it happens in the real world--sweet, messy, fun, not always gorgeous, but a way to show love. Which doesn't make it any less delicious; to the contrary, Charmian Christie's flavor combinations rise far above the ordinary. Why have a raspberry galette when you can enjoy a raspberry-rhubarb galette with drippy, unctuous walnut frangipane? Or how about a Brie and walnut whiskey tart? It's all yours without the rigid perfectionism or complicated instructions of other gourmet cookbooks. Christie's warm, irreverent voice brings the fun back into baking at a time when home cooks--pulled from pillar to post by jobs and errands--need to have fun. The Messy Baker is a full-service book that not only guides the reader through simple, delicious recipes but is also there to help out when things go wrong. For anyone who gave in frustration when that cake collapsed or the frosting smeared, Christie's practical advice is here to rescue even the worst disaster and inspire the baker to try the next recipe. "A celebration of real baking in all its messy, boisterous, and delicious glory. Since when did every cookie on the plate have to be just like the next? Or each layer of cake exactly the same height? Each piecrust an impeccable work of art and encircled by stunningly perfect pastry leaves? To the uninitiated, all that fastidious, spotless baking is intimidating, not to mention exhausting. The Messy Baker celebrates baking as it happens in the real world--sweet, messy, fun, not always gorgeous, but a way to show love. Which doesn't make it any less delicious; to the contrary, Charmian Christie's flavor combinations rise far above the ordinary. Why have a raspberry galette when you can enjoy a raspberry-rhubarb galette with drippy, unctuous walnut frangipane? Or how about a Brie and walnut whiskey tart? It's all yours without the rigid perfectionism or complicated instructions of other gourmet cookbooks. Christie's warm, irreverent voice brings the fun back into baking at a time when home cooks--pulled from pillar to post by jobs and errands--need to have fun. The Messy Baker is a full-service book that not only guides the reader through simple, delicious recipes but is also there to help out when things go wrong. For anyone who gave in frustration when that cake collapsed or the frosting smeared, Christie's practical advice is here to rescue even the worst disaster and inspire the baker to try the next recipe"--,Provided by publisher. Christie, C. (2014). The messy baker: more than 75 delicious recipes from a real kitchen. [Place of publication not identified]: St Martins Pr. Christie, Charmian. 2014. The Messy Baker: More Than 75 Delicious Recipes From a Real Kitchen. [Place of publication not identified]: St Martins Pr. 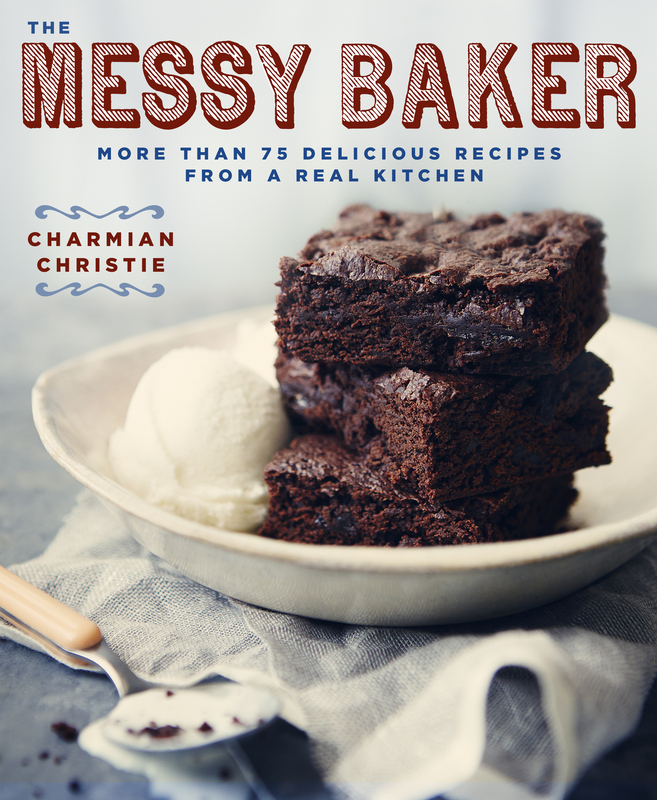 Christie, Charmian, The Messy Baker: More Than 75 Delicious Recipes From a Real Kitchen. [Place of publication not identified]: St Martins Pr, 2014. Christie, Charmian. The Messy Baker: More Than 75 Delicious Recipes From a Real Kitchen. [Place of publication not identified]: St Martins Pr, 2014. Print. |a The messy baker : |b more than 75 delicious recipes from a real kitchen / |c Charmian Christie. |a [Place of publication not identified] : |b St Martins Pr, |c 2014. |a Emmaus, Pennsylvania : |b Rodale Books, |c 2014. |a "A celebration of real baking in all its messy, boisterous, and delicious glory. Since when did every cookie on the plate have to be just like the next? Or each layer of cake exactly the same height? Each piecrust an impeccable work of art and encircled by stunningly perfect pastry leaves? To the uninitiated, all that fastidious, spotless baking is intimidating, not to mention exhausting. The Messy Baker celebrates baking as it happens in the real world--sweet, messy, fun, not always gorgeous, but a way to show love. Which doesn't make it any less delicious; to the contrary, Charmian Christie's flavor combinations rise far above the ordinary. Why have a raspberry galette when you can enjoy a raspberry-rhubarb galette with drippy, unctuous walnut frangipane? Or how about a Brie and walnut whiskey tart? It's all yours without the rigid perfectionism or complicated instructions of other gourmet cookbooks. Christie's warm, irreverent voice brings the fun back into baking at a time when home cooks--pulled from pillar to post by jobs and errands--need to have fun. The Messy Baker is a full-service book that not only guides the reader through simple, delicious recipes but is also there to help out when things go wrong. For anyone who gave in frustration when that cake collapsed or the frosting smeared, Christie's practical advice is here to rescue even the worst disaster and inspire the baker to try the next recipe"-- |c Provided by publisher.